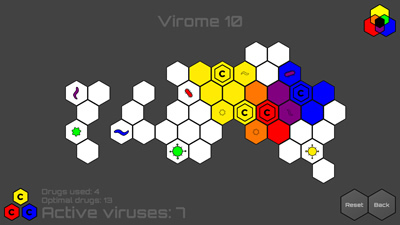 Use your puzzle-solving skills to treat the rampant viruses before they infect the world. Find the correct combination of drugs to complete the puzzle, but be careful not to overdose any cells! Think you've solved all the puzzles? 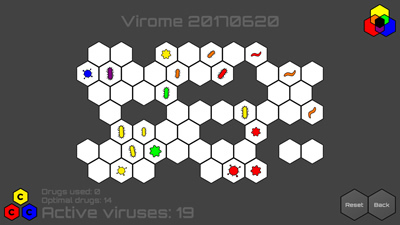 A scientist's work is never done with the Daily Virome and a random puzzle generator. Solve a set of increasingly difficult puzzles. Can you find the optimal solution? © Centrifuge Ltd, 2017-2019. Virome is a trademark of Centrifuge Ltd.